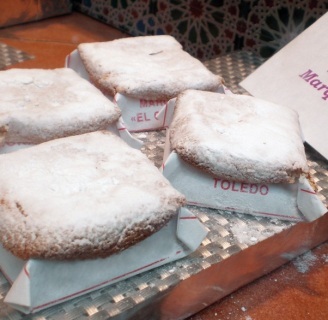 'Figuritas de Mazapan', Toledo's Marzipan figurines made using traditional methods. 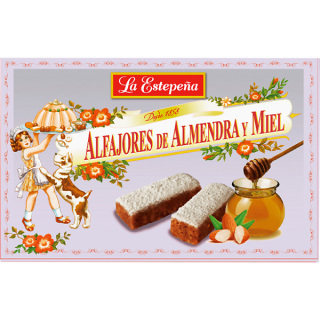 Ingredients: Almonds, sugar, honey and eggs. 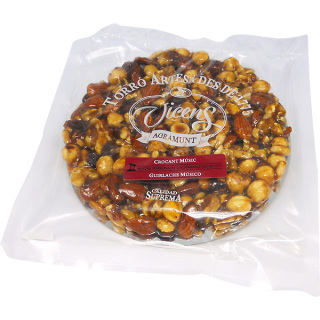 Only available in Christmas season (December and January). 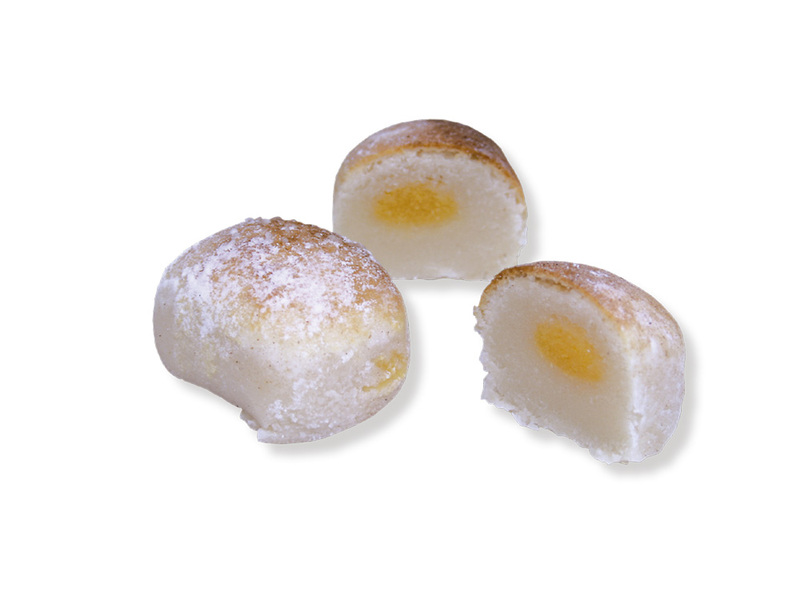 Marzipan filled with Egg Yolk made with Mazapan de Toledo PGI. Ingredients: Almonds, sugar, honey, egg yolk and eggs. With a heart of candied egg yolk wrapped in marzipan… an irresistible speciality. 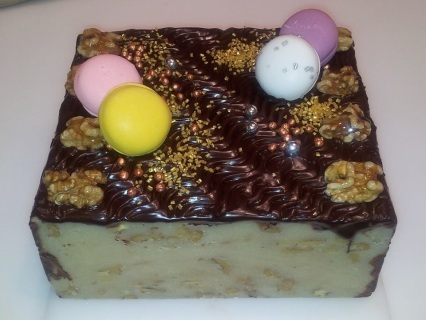 Egg Yolk Cakes made with Mazapan de Toledo PGI. 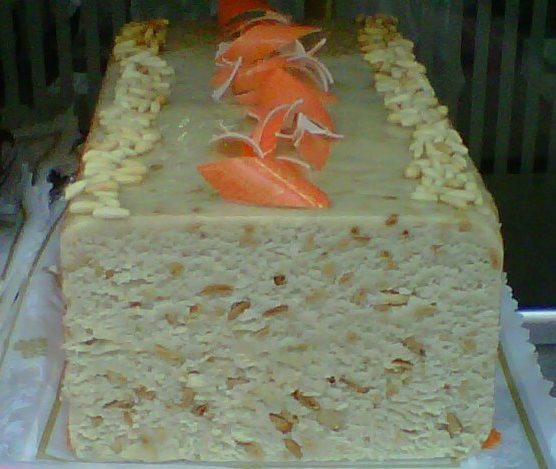 Marzipan Sponge Cake made with Mazapan de Toledo PGI. 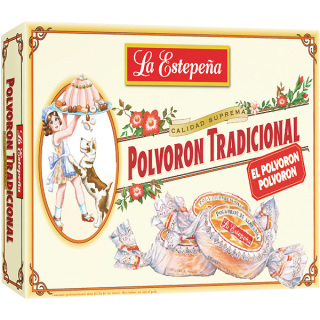 Traditional Polvorones are a crumbly Spanish shortbread with almonds. 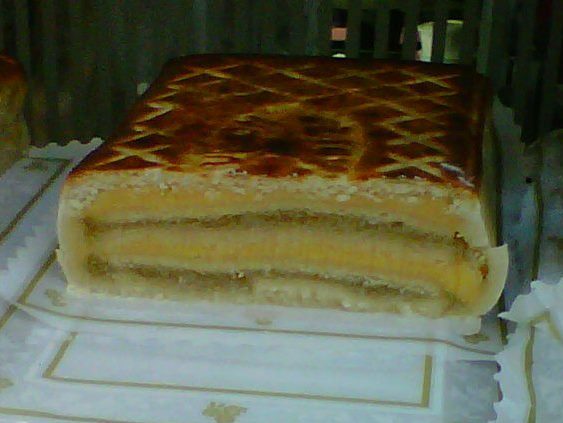 Typical Christmas sweet cake made with almond, flour, lard, sugar, cinnamon and sesame, then baked in the oven. 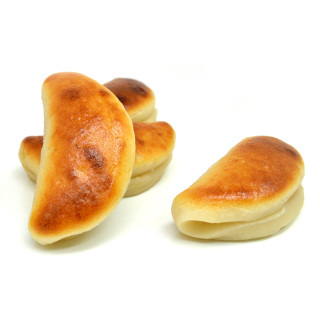 It is shaped into small cakes and wrapped in paper. 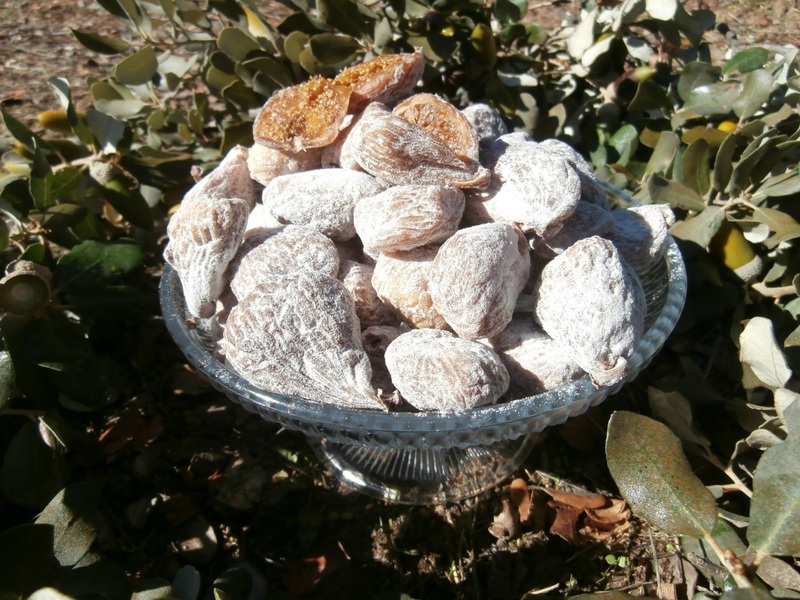 Soft Jijona almond nougat stuffed almonds. 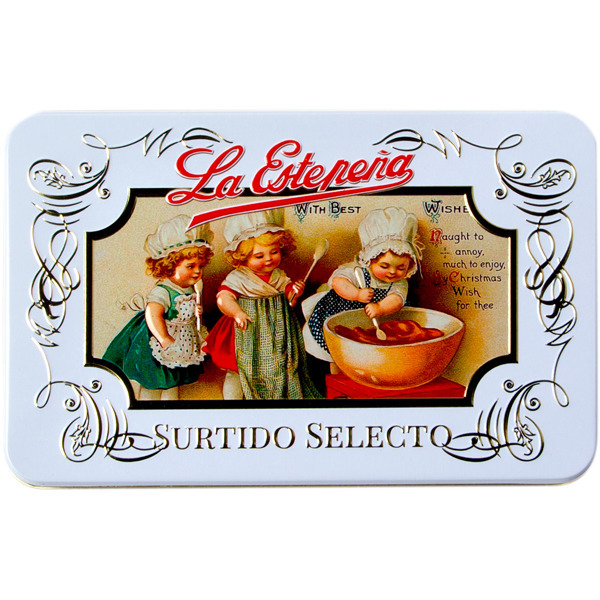 Great Assortment Selection of Specialties by La Estepeña. 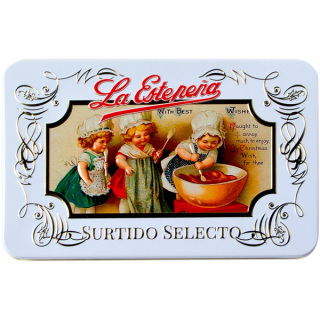 Gran Surtido selecto, calidad suprema. Contains: marzipan bear, alfajores, almond delights, hojaldradas puff-pastries, almond crumble cakes, cinnamon mantecados, roscos de vino, candied orange. chocolate covered coconut balls, pastel de gloria, estepeñitas, chocolate mantecados. Marzipan glories cake 'Pasteles de Gloria' is a typical Christmas sweet of Spain. 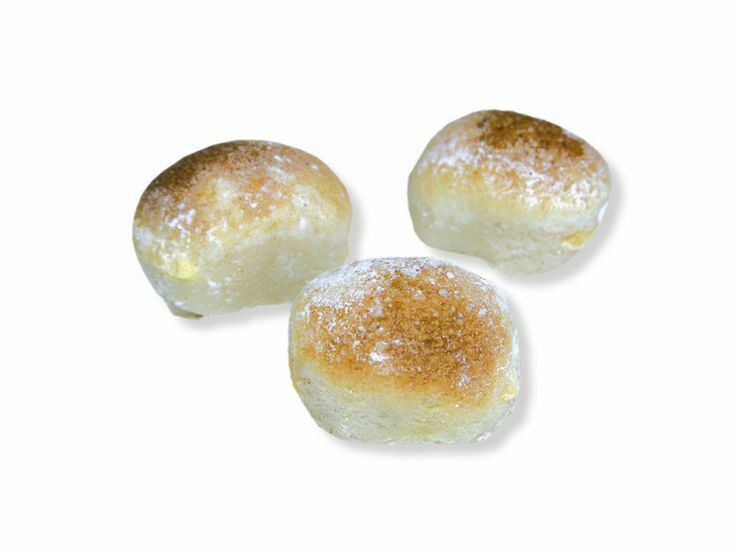 With a heart of sweet potatoe wrapped in marzipan and covered with a bit of glass sugar and cinnamon… an irresistible speciality. 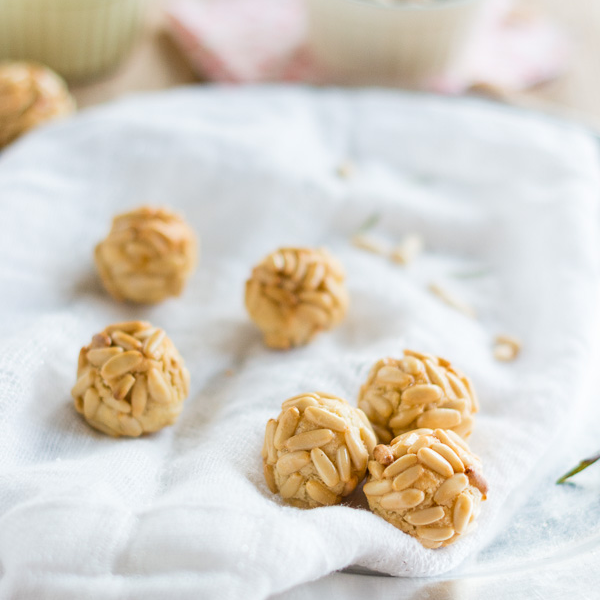 'Empinonadas' or 'Panellets' made using traditional methods. 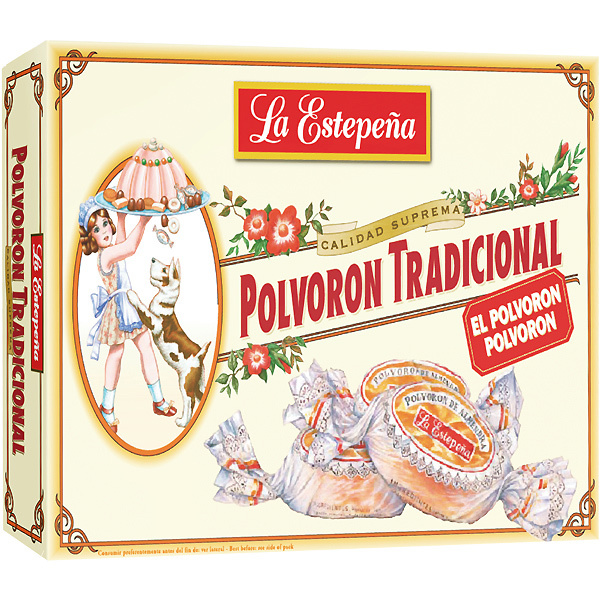 Toledo's marzipan rolled with Spanish pine nuts from Castile. Ingredients: Almonds, sugar, honey, egg and pine nuts. 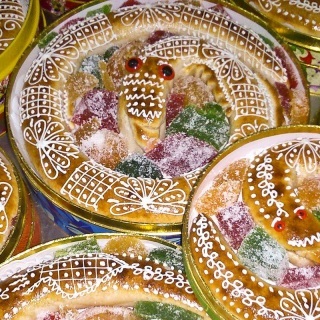 Marzipan Eels are completely handmade product, made of Toledo marzipan filled with crystallized yolk, slowly baked and decorated with royal icing and garnished with candied fruits. 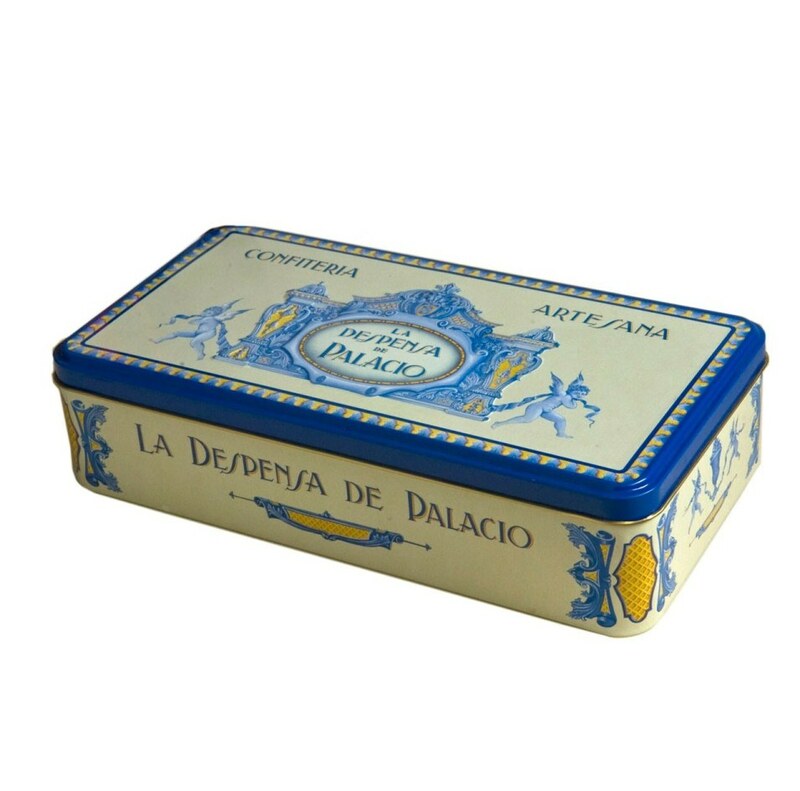 Artisan product made in Toledo. 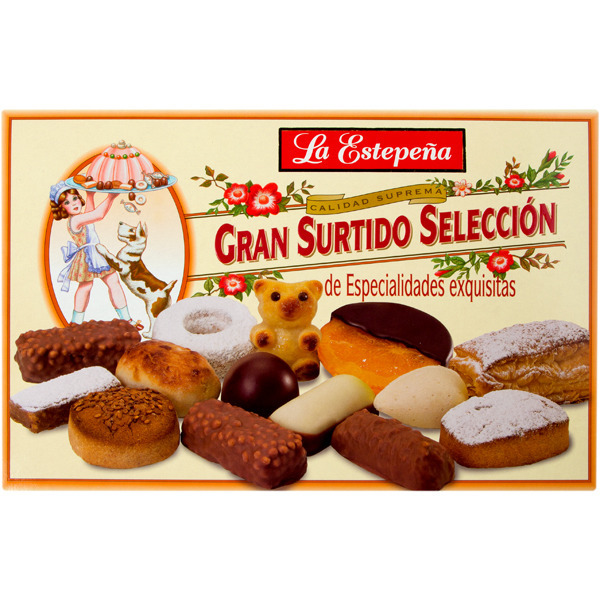 La Estepena Surtido Selecto Almond Pastries includes Mantecados, Polvorones, Delicacies and Roscos Finos. 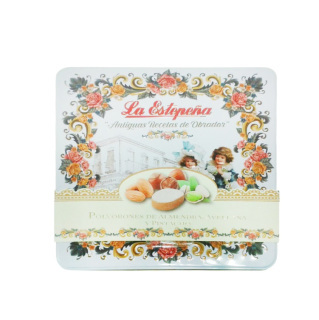 Assortment Premium Polvorones handmade by La Estepeña: Almond, Wholenut and Pistachio. 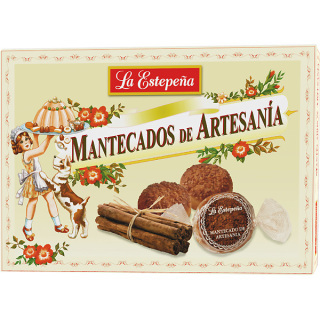 ​The most exlusive Christmas sweets of Spain. ​​La Despensa de Palacio (in english Palace Pantry), workshop situated in Estepa, Sevilla, presents an exquisite range of Christmas delicacies, handmade products recovered from old cookbooks and ingredients of the highest quality as 'Queen's fine cinnamon', the sublime vanilla Bourbon (Reunion Island), Pedro Ximénez wine (Axarquia Malaga), lemons of Velez- Málaga, rosemary and orange blossom honeys of Estepa, pistachios of the Simeto Valley, larguetas almonds of the mountains of Alhama , marcona almonds, etc... not to mention the cocoa which is amazing. 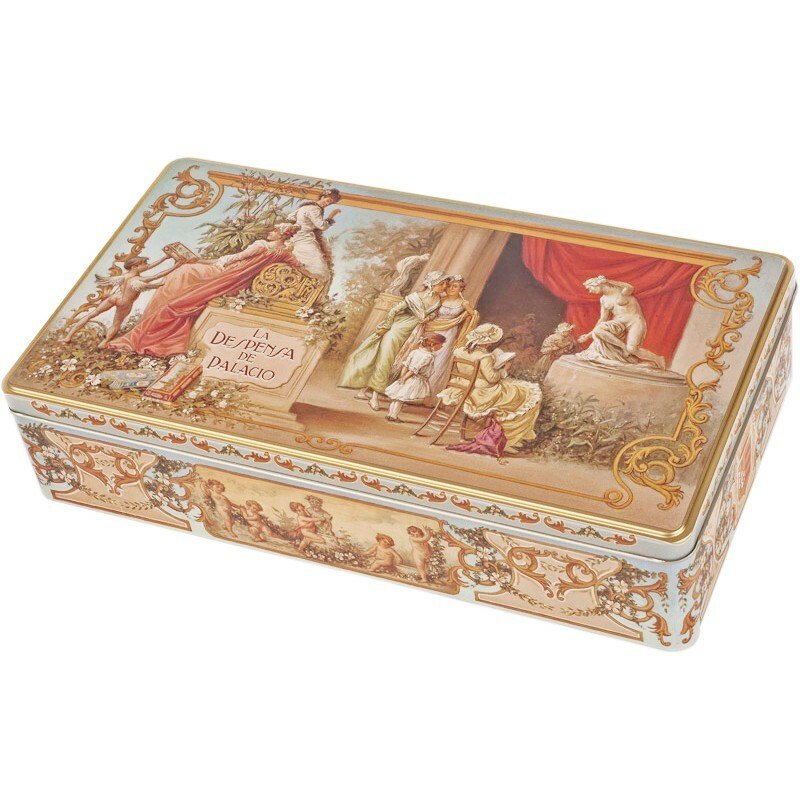 Premium quality large marzipan sweet (made with almonds and sugar), handmade by La Mallorquina, Madrid’s sweet-tooth mecca since 1894. Premium quality roasted yolk nougat handmade by La Mallorquina, Madrid’s sweet-tooth mecca since 1894. 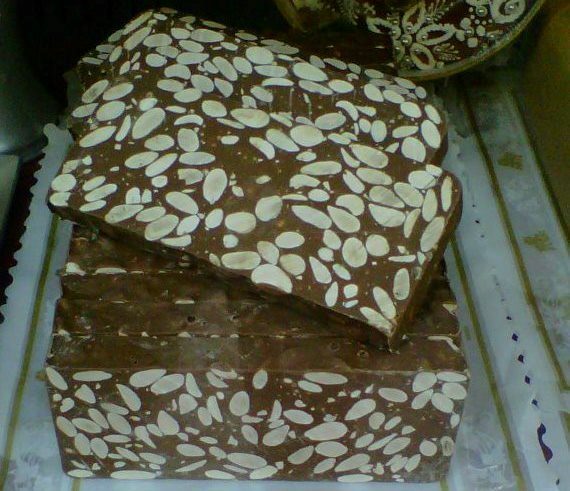 Premium quality nougat with almonds and chocolate handmade by La Mallorquina, Madrid’s sweet-tooth mecca since 1894. Premium quality pistachio nougat handmade by La Mallorquina, Madrid’s sweet-tooth mecca since 1894. 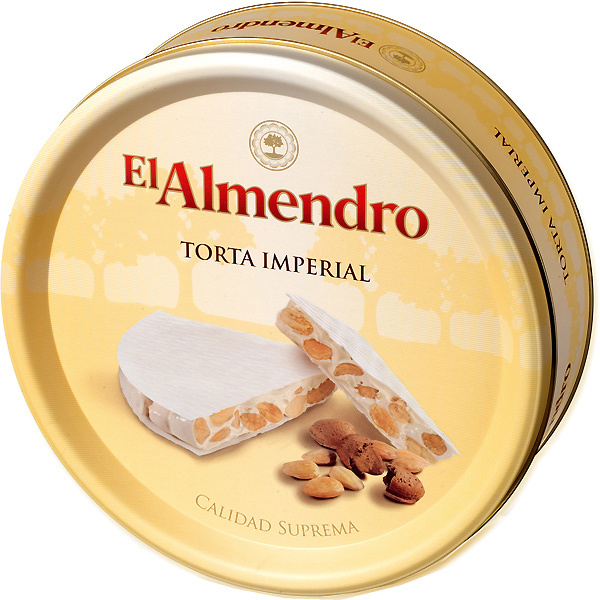 Premium quality walnuts nougat, handmade by La Mallorquina, Madrid’s sweet-tooth mecca since 1894. 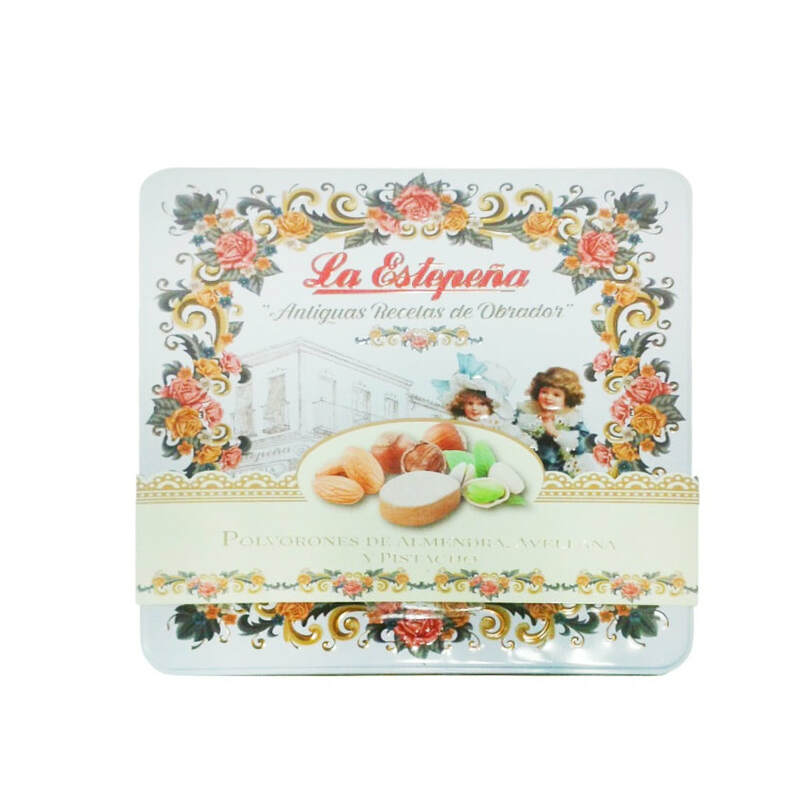 Premium quality nougat with pine nuts handmade by La Mallorquina, Madrid’s sweet-tooth mecca since 1894. 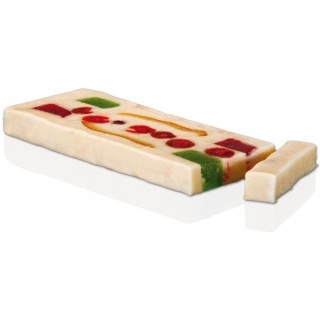 A carefully combination of the best marzipan Nougat with fruits. An explosion of textures and really incredible tasteful flavours. 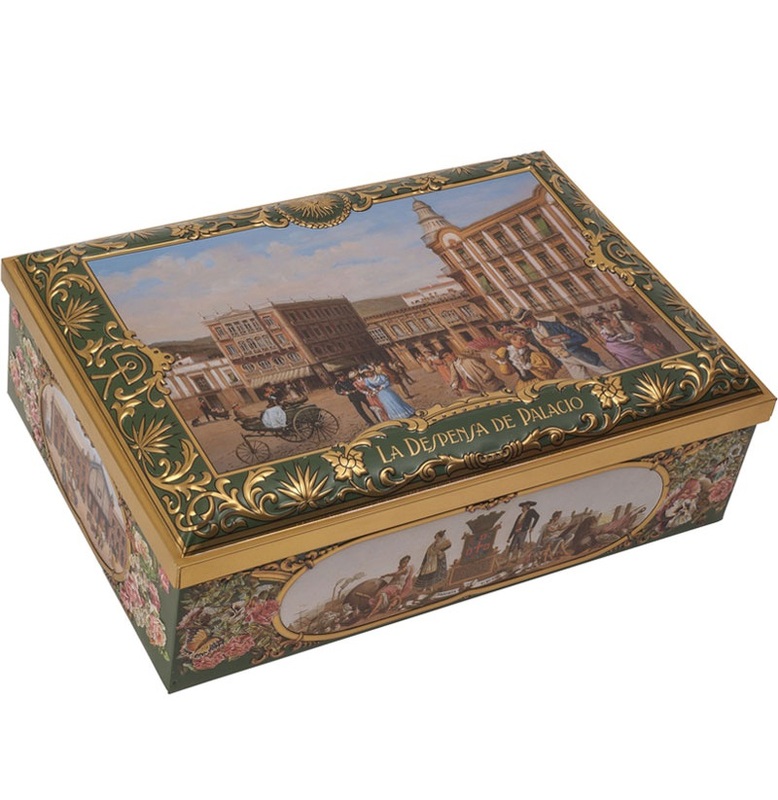 Vicens d'Agramunt, masters at the art of creating nougat, have been creating nougat since 1775. 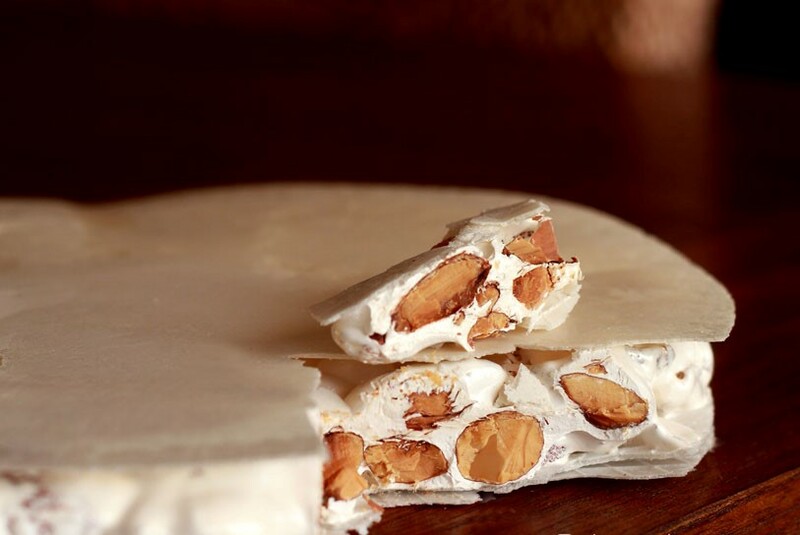 The town of Agramunt, located in central Catalonia, has been famed for its production of nougat for hundreds of years. 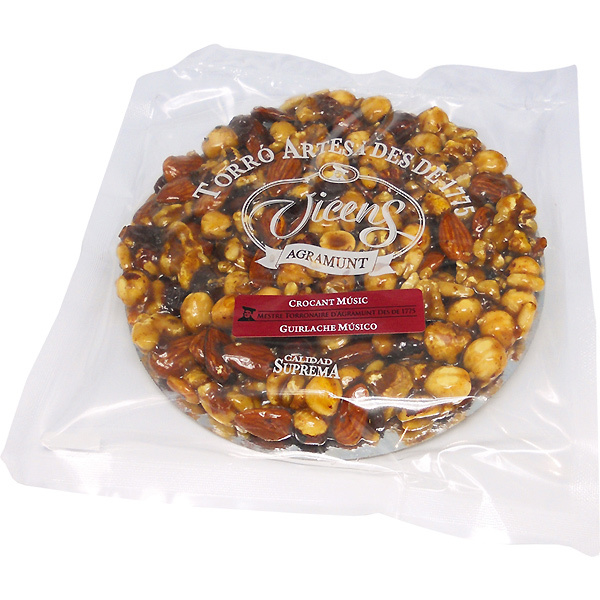 Mixed Nuts Guirlache Nougat with almonds, hazelnuts, pine nuts, walnut, raisins and honey elaborated by Vicens, nougat master since 1775. Marcona Almond Guirlache Nougat elaborated by Vicens, nougat master since 1775. The origin of this nougat is in the medieval period. The best selection of these nuts of our lands, coated with honey result a crunchy and sweet sensation. 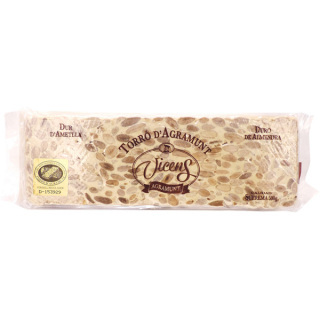 Turron de Agramunt, a confectionery made from peeled, roasted almonds with honey, sugar, egg white and wafers elaborated by Vicens, nougat master since 1775. 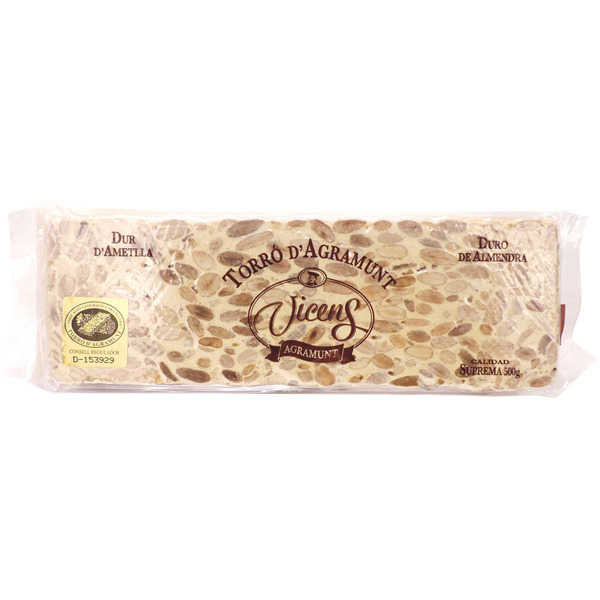 The most traditional and authentic Agramunt's nougat preserves intact their handmade process through centuries of history. 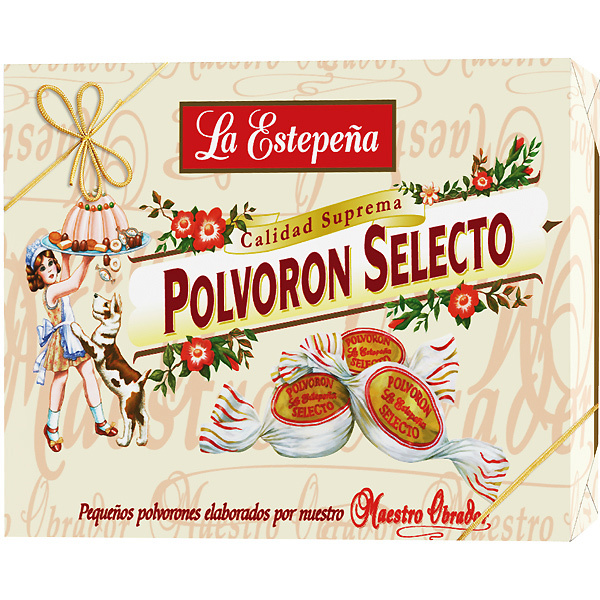 Generation behind generation Vicens nougat masters keep the recipe of this delicious sweet which arrives till today like the old times. With Arabic origins, this traditional honey and almond sweet is a round, slightly thinner version of the turron duro ("hard turron") and resembles French nougat with its brittle, crunchy texture. 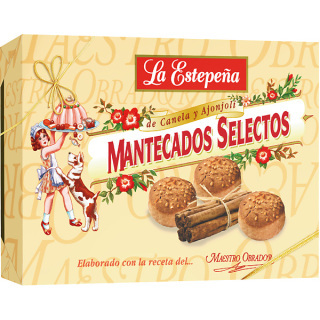 A typical Christmas time treat in Spain. Prepared by delicate hands, following the genuine artisan production method. 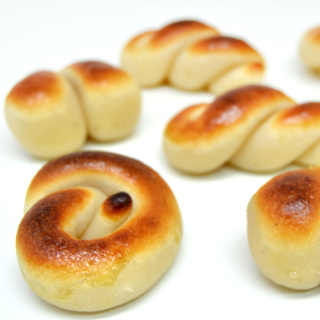 Kneaded with cinnamon and covered with sesame seeds. Traditionally wrapped in tissue paper. 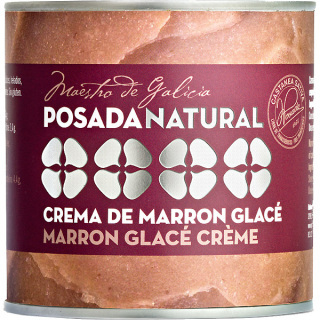 Ingredients: Wheat flour, sugar, Iberian pork lard, sesame seeds and ground cinnamon. 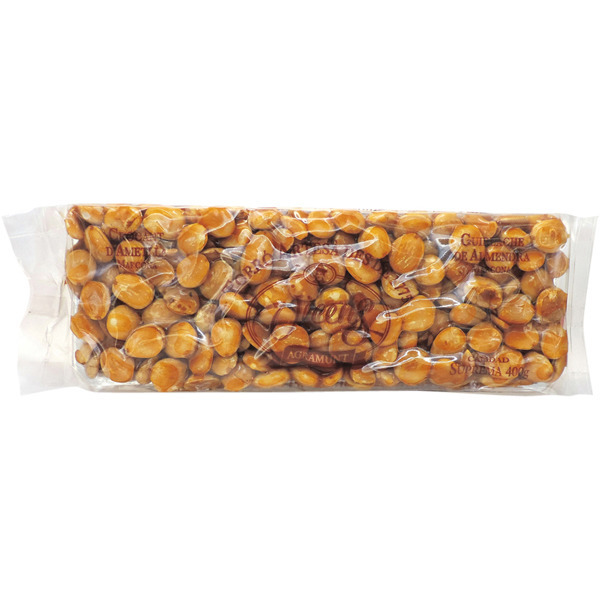 Allergens: Contains gluten, soy and sesame. 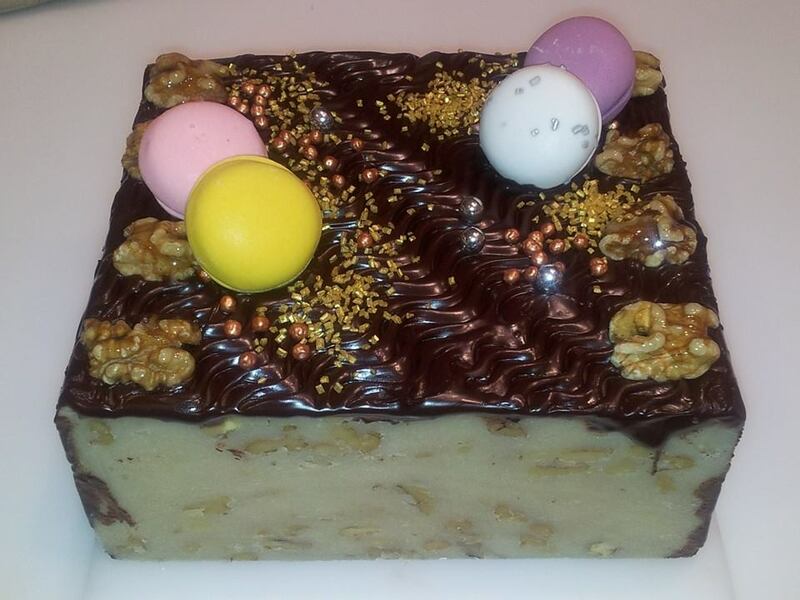 May contain traces of egg, milk, nuts and peanuts. 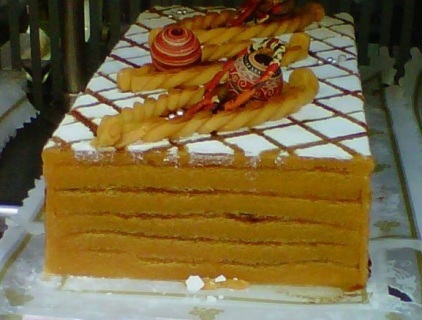 Cakes made in the Arab tradition from pure bees' honey, almonds, hazelnuts, flour, breadcrumbs and spices (coriander, clove, anise, sesame and cinnamon). 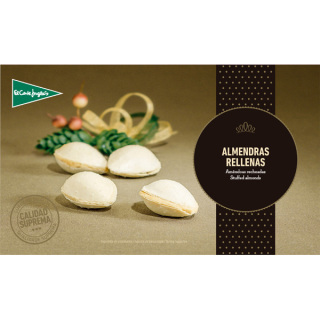 Polvorones are a crumbly Spanish shortbread with almonds. 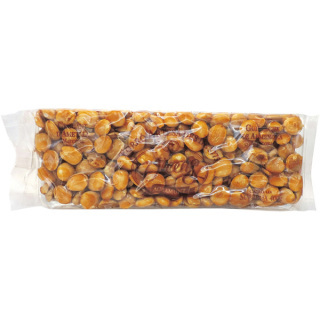 Characterized by its sesame topping and unmistakable fine cinnamon (also known as queen cinnamon) flavor, from Sri Lanka (formerly Ceylon). 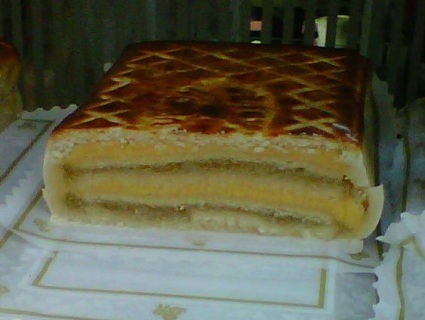 The classic mantecado. 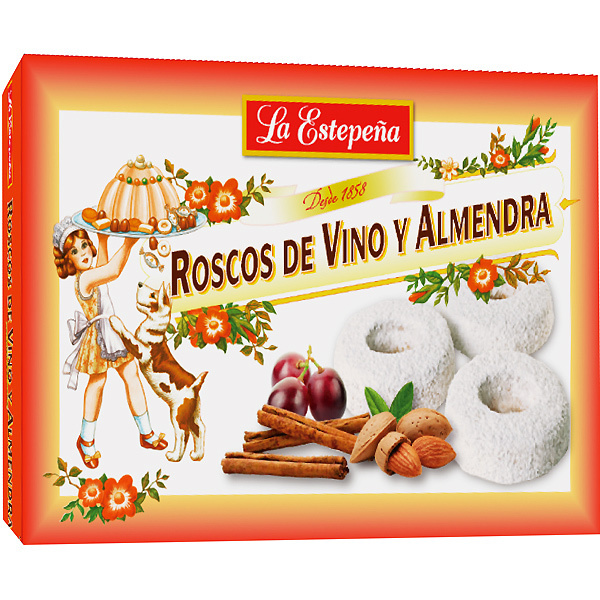 Almond ring cookies with wine. 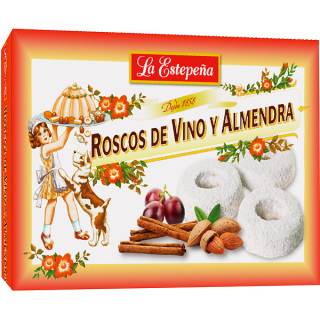 Roscos Finos are donut shaped cookies popular around Christmas time. The recipe for this traditional holiday treat includes a touch of wine and cinnamon. The result is a delicious cookie with a unique flavor - a true taste of traditional Spain. 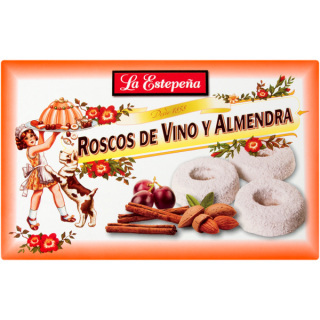 Almond donough pastries with sweet wine. 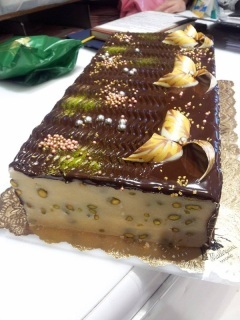 only available in Christmas season (November and December). 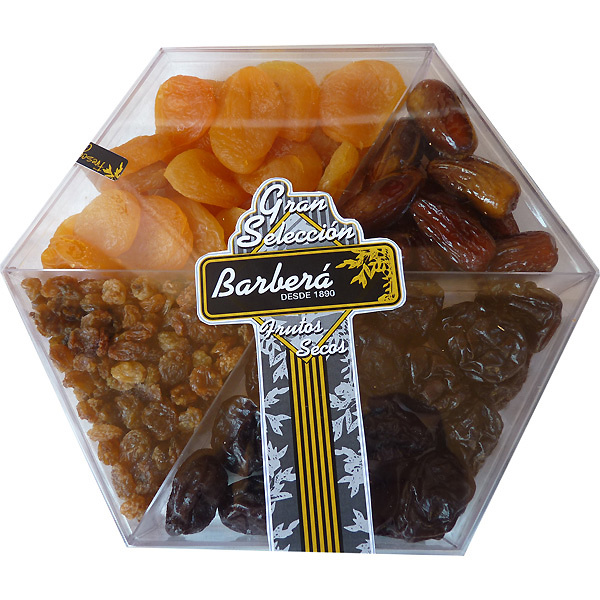 Dried aprictos, raisins, plums and, dates. 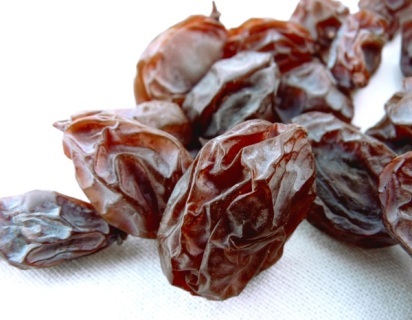 Rich, sweet moscatel raisins on the vine that have been dried in the last rays of the Malaga summer sun. The vines also dress cheese-boards beautifully. The art of drying grapes has been practised since early times in the province of Malaga. 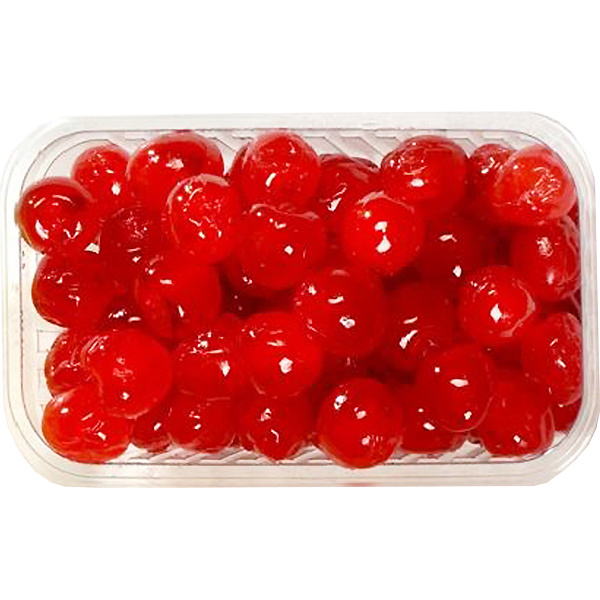 The production technique begins with the harvesting of the bunches. Then they are set out in the sun on the classic drying trellises or ‘paseros’ (artificial dryers are forbidden), in well ventilated areas. They are presented individually and in bunches, and in both cases they must be whole, well formed and sufficiently developed, uniformly dark red in colour, with a wrinkled, fleshy texture and seeds. The flavour must be sweet, intense and lasting. They have multiple uses in gastronomy. They are irreplaceable in Arabic cooking and they are actually ingredients in many recipes from many countries. 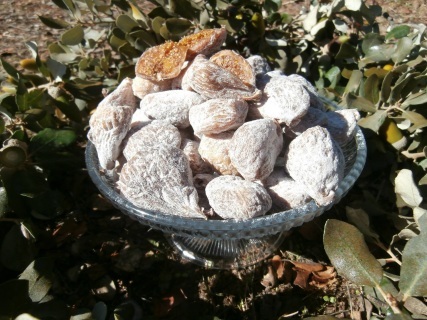 White fig that is very sweet with a thin skin. It is grown in the central part of Spain in the Tiétar Valley of the Gredos Mountains. 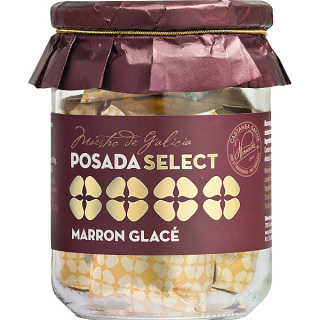 Delicious as dessert with nuts, cheese, or to cook them for a special sauce. 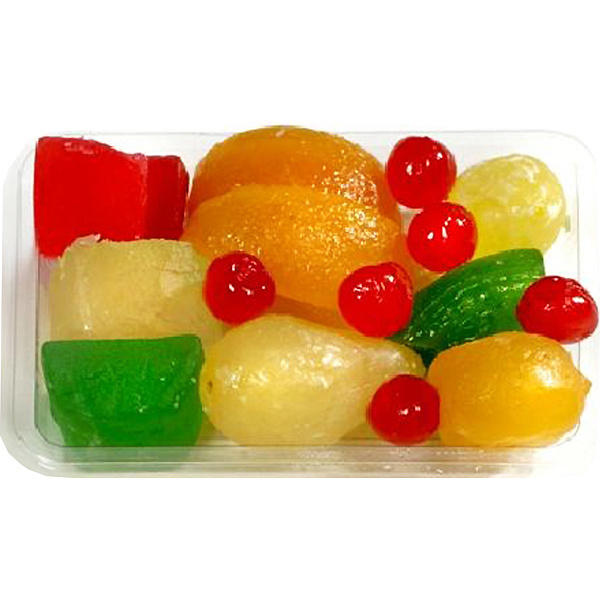 Candied fruits are the result of a process involving various fresh fruits which are transformed into a syrupy sweet by means of the addition of sugar. 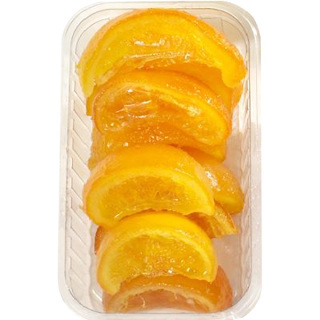 They are also known as “crystallized fruits” or “glacé fruits”. Mainly sweet with fruity aromas. The fruit retains its original color although it is usually possible to see through the translucent layer of sugar coating, which gives these sweets a shiny appearance. 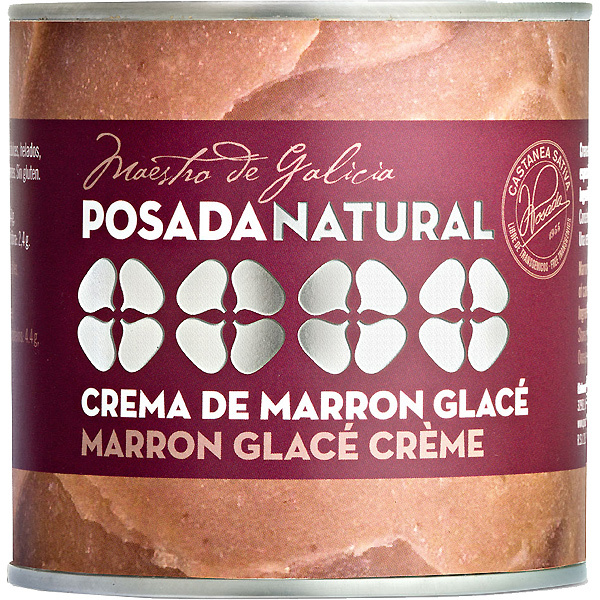 Marron Glacé wrapped in gold foil, vacuum packed with oxygen absorber in cristral bottle ellaborated by José Posada with best Galician chestnuts since 1955. 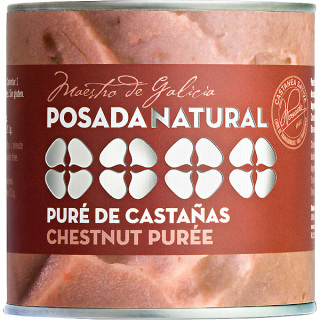 Delicious with your roasted meats, duck magrett, game dishes and smaller poultry. Delicious with roasted meats, duck magrett, game dishes and smaller poultry.